Kellogg (K), founded in 1906, is a global manufacturer and marketer of ready-to-eat cereal and convenience foods such as cookies, crackers, savory snacks, toaster pastries, cereal bars, fruit-flavored snacks, frozen waffles, and veggie foods. Kellogg's core brands, which drive almost 40% of its sales in North America, include Kellogg’s, Pop Tarts, Eggo, Froot Loops, and Rice Krispies. Some of its most popular snacks brands are Pringles, Keebler, Cheez-It, and Famous Amos. Kellogg is the world’s leading producer of cereal and toaster pastries, the second largest manufacturer of cookies and crackers, as well as one of the largest producers of savory snacks and frozen foods such as waffles and vegetables. Kellogg primarily sells its products to large retailers such as Walmart (20% of sales), and while the business operates globally, 60% of the company’s revenue is from the U.S. 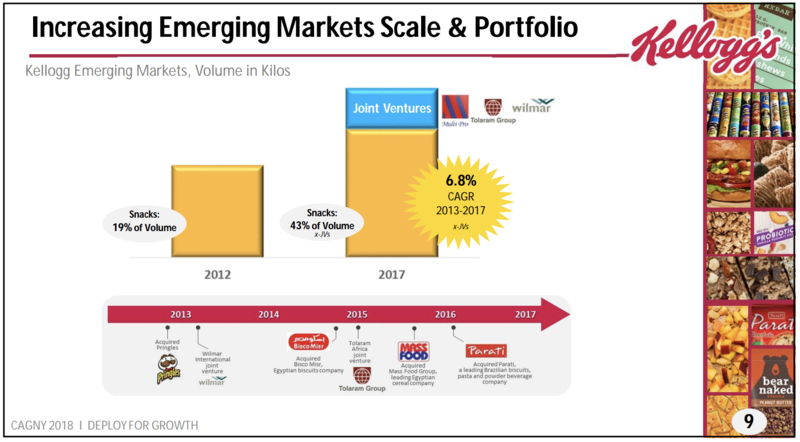 Emerging markets account for about 20% of Kellogg's overall revenue and are expected to be a key long-term growth driver. Overall, Kellogg operates through seven main segments: U.S. Snacks (25% of sales); U.S. Morning Foods (23%); U.S. Specialty (9%); North America Other (12%); Europe (18%); Latin America (6%); and Asia Pacific (7%). Note that the company announced a major change to its distribution strategy in 2017, shifting away from a direct-to-store model and towards warehouse deliveries. This is expected to greatly lower Kellogg's operating expenses and was completed by the end of 2017. For more than 100 years, Kellogg has developed one of the best portfolios of name brand cereals, cookies, and snacks. The company has three major competitive advantages that revolve around its well-known products and have allowed it to pay uninterrupted dividends since 1925. Kellogg's first advantage stems from its strong brands, which have benefited from over a century of advertising spending and management's efforts to expand the portfolio through acquisitions and in-house development of new products. In fact, in 2017 the company spent $731 million on advertising (5.7% of sales) and $148 million on R&D (1.1% of sales). Today Kellogg has three brands with annual sales over $1 billion while six enjoy revenues of over $500 million per year. Kellogg has been an industry leader in innovation, having literally invented the modern breakfast cereal, which is one of the lowest cost ways of obtaining numerous vitamins and minerals. This has helped the firm build long-standing and trusted relationships with consumers, especially parents. Another key advantage is the company’s ability to shift its business model to better match consumer tastes. For example, when cereals started to fall out of fashion in favor of on-the-go breakfast foods, the company shifted its focus to acquiring and launching snack products which were still enjoying strong growth. Now consumer taste’s have shifted once more, with an increased focus on healthy foods and away from high calorie snacks. This has resulted in the company struggling with years of sales declines. In fact, Kellogg's revenue declined by 1.9% annually from 2013 through 2017. Kellogg’s next competitive advantage is its global supply, distribution, and manufacturing chains, which the company has spent over 100 years and tens of billions of dollars building. In 2017 Kellogg shifted away from direct-to-store deliveries and towards a warehouse delivery model, meaning that its retail customers will now be responsible for transporting its products from their centralized warehouses to their individual stores. Management expects this to reduce costs by about $650 million by 2019. If realized, those savings represent about 6% of Kellogg's total costs of goods sold. For a company with just $13 billion in annual sales, those are significant cost savings that will free up cash for paying down debt (more on this in a moment) or increasing advertising spending. In recent years, Kellogg’s rivals have pulled back on the their advertising budgets, but the company has not. This is because management is convinced that maintaining market share and driving continued top line growth will require sustained strong investments in its brands. 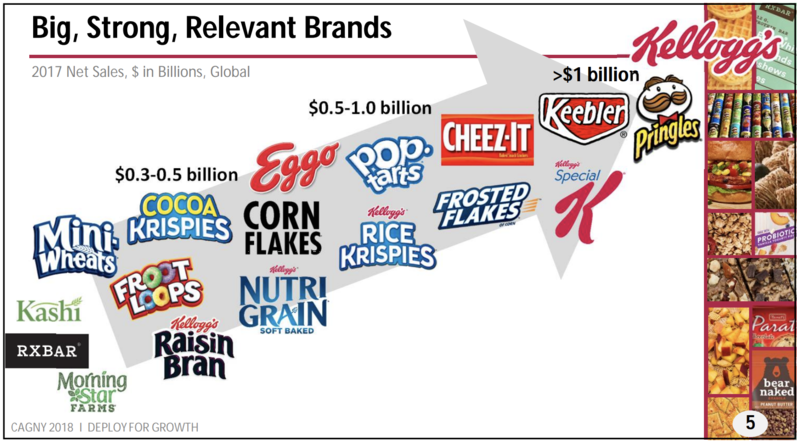 As a result, analysts estimate that Kellogg’s could boost its ad budget to 8% of revenue in the coming years (up from 5.7% in 2017). And given that Kellogg expects several cost cutting initiatives (Project K and Zero-based budgeting) to result in higher margins over time, this bodes well for the future of the company’s long-term profitable growth. This leads us to another competitive advantage for the company, which is its strong relationship with retail partners. 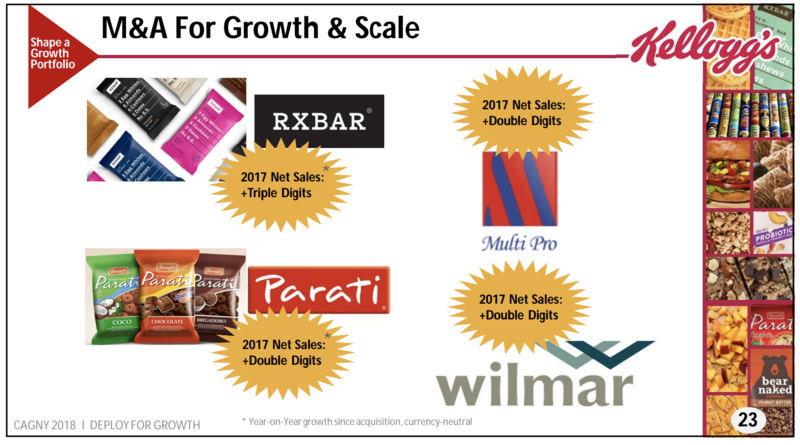 Kellogg’s strong brands are a key driver of retail customer traffic for companies such as Walmart, Costco (COST), Target (TGT), and Kroger (KR). Even with the new warehouse-focused distribution strategy (which shifts costs to retail partners), Kellogg is likely to retain good shelf space placement, which is critical to maintaining market share and driving top line revenue growth. Thanks to its industry leading economies of scale, as well as its portfolio of strong name brands, Kellogg's enjoys some of the best profitability in the industry. However, thanks to its frequent bolt-on acquisitions of new brands and on-trend product categories, Kellogg’s has above average debt levels. The company still maintains a BBB investment grade credit rating from Standard & Poor's and enjoys relatively low borrowing costs, but Kellogg's dividend growth potential will be reduced until management pays down some of its debt. Returning the company to profitable growth will be key. Fortunately, in recent quarters Kellogg's U.S. operations have stabilized while its emerging markets business continues to enjoy robust sales due to success in its overseas snack business. 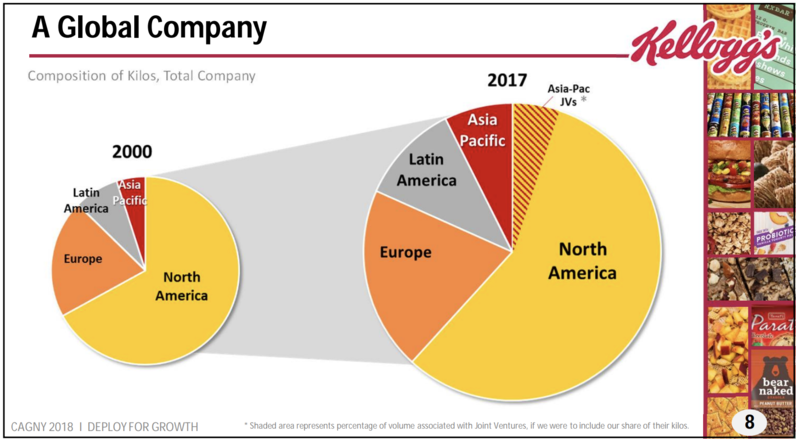 Kellogg has been aggressive in expanding its emerging market exposure by acquisitions as well as joint ventures, helping drive 6.8% annual volume growth in international snacks over the last five years. Meanwhile, the company's U.S. turnaround has been focused on both increasing the firm's overall snack brands (such as by buying Pringles in 2013), as well as new products focused on healthier, all natural ingredients. Kellogg has also been aggressively acquiring smaller, healthier, and rapidly growing snack food brands to kick start the growth of its own healthier offerings. The company has also been experimenting with smaller, single-serve packages, focused on increased convenience. Single-serve packages are proving increasingly popular with Millennials, who are now the largest generation in U.S. history. This is all part of the company’s 2020 growth plan which calls for stabilizing its core cereal business while achieving low to mid-single-digit growth in its other product segments and markets. Over the long term, Kellogg thinks its combination of emerging market growth, new product offerings, and increased marketing budget can achieve 1% to 3% annual revenue growth, which it expects to translate into 6% to 8% per year earnings growth through improved efficiencies and higher margins. 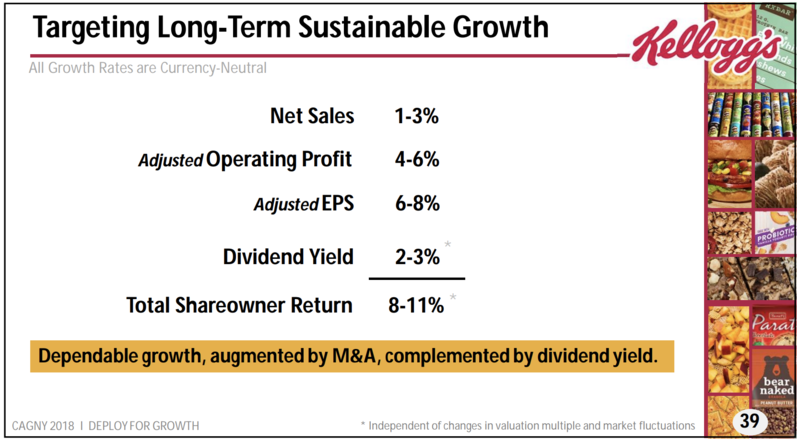 If management can achieve this goal, then it should allow the company to easily continue its long-term dividend growth rate of about 5%, and potentially even increase it a bit. However, there are numerous risks facing the company that could cause its growth to miss management’s forecasts in the coming years. Over the short term, Kellogg's results can be impacted by foreign currency exchange rate fluctuations (40% of sales are from overseas markets), commodity price volatility (although Kellogg maintains long-term contracts for key agricultural inputs), and rising transportation costs. However, none of these issues seem likely to weight on Kellogg's long-term earnings power. 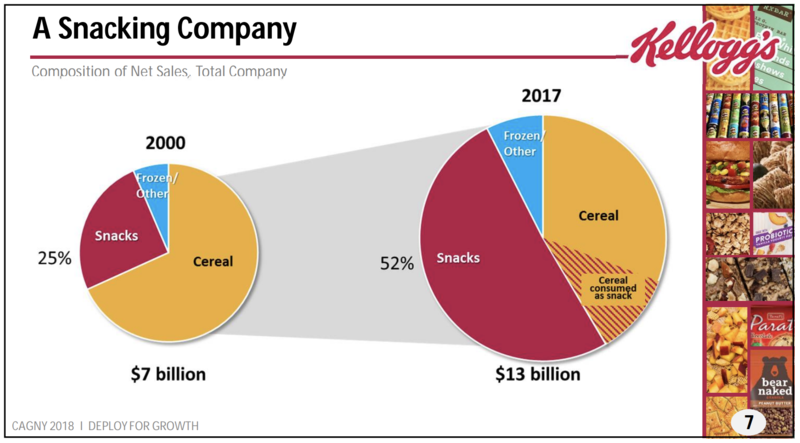 More importantly, while Kellogg is transitioning to a greater focus on healthier foods and snacks, its core business remains ready-to-eat cereal. The global cereal market, even factoring in strong emerging market growth, is expected to grow very moderately over the years ahead. To help fight this slow growth, Kellogg is focusing more on its healthy cereal offerings, particularly its Kashi and MorningStar Farms brands. In total, the company hopes that natural and organic brands will account for $1 billion in sales by 2020. However, part of that strategy involves ongoing bolt-on acquisitions of small and fast-growing healthy brands. Each acquisition exposes Kellogg to execution risk, especially the potential to overpay for a deal. 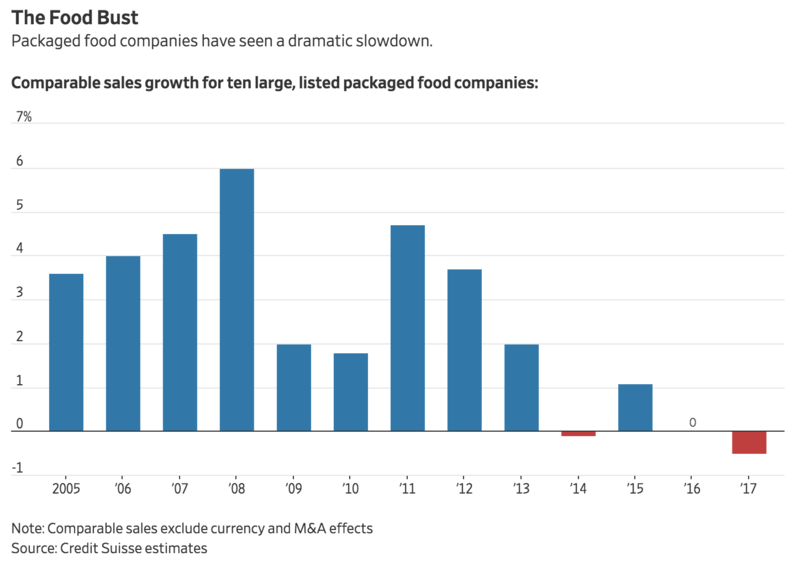 This is a growing threat given that food and consumer staples companies are all struggling with weak organic growth, creating increased pressure to pay top dollar for anything with strong growth potential. For example, in 2017 Kellogg paid $600 million to acquire RXBAR, a fast-growing manufacturer of protein bars. RXBAR only had 75 employees and was projected to generate $100 million in annual sales that year, representing a steep price-to-sales multiple of 6x for the deal. Management is itching to diversify the business and return it to growth, but pulling the trigger on pricey acquisitions and trying to manage new types of brands results in a number of risks. Simply put, there is no guarantee that Kellogg can return to profitable growth over the long term. As you can see, almost all of the largest packaged food companies have lost market share over the last five years. Shifting these giants to focus on healthier, simpler ingredients and combat upstarts brands infringing on their shelf space is no small task. Kellogg has tried diversifying away from its struggling cereal business by pouring money into various snack company acquisitions, but management has not yet had much success in improving the performance of the company's existing brands. Thanks to its 112-year history of innovation and strong brand building, Kellogg is likely to remain a cash cow and deliver consistent, but moderate, dividend growth for many years to come. The company is still proving its ability to adapt to today's shifting consumer tastes, which have challenged virtually all of the packaged food giants. Kellogg appears to be taking the right steps by investing aggressively in its brands while cutting more discretionary costs in other areas of the business. However, given the company's concentration in cereal and developed markets, plus management's struggles to squeeze better growth out of Kellogg's existing brands, conservative investors may want to demand a very attractive valuation to before giving this stock closer consideration.